Bali Island is a prima donna of Indonesian tourism which is well known throughout the world. 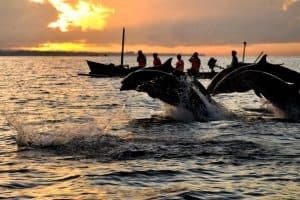 Besides being famous for its natural beauty, especially its beaches, Bali is also famous for its unique and interesting arts and culture. Kuta Beach is the most famous tourist spot in Bali and most visited by tourists. The location is close to the airport and has a beautiful view. Kuta Beach waves are suitable for beginner surfers. 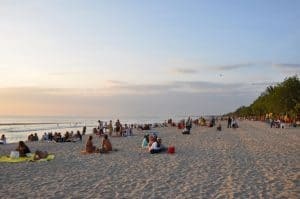 Kuta Beach is also famous for its beautiful sunset panorama. 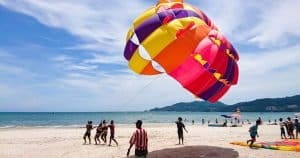 This beach has white sand and blue sea, equipped with very complete supporting facilities, Kuta Beach is a favorite of Bali tourism that you must visit while on vacation. Tanah Lot Temple is one of the tourist attractions in Bali which is famous for its beauty, especially at sunset. 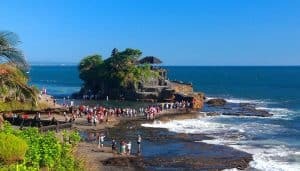 Tanah Lot Temple which consists of 2 temples is a temple to worship the sea god. The location of this temple is on a large rock on the seafront, is unique. During high tide, visitors cannot visit lot land because the surroundings will be filled with water that closes access to the temple. When the water has receded, visitors are treated to views of some tame sea snakes on the beach. According to locals, the snakes are the guards of Tanah Lot. Padang Padang Beach may be less well known compared to Kuta Beach, but Padang Padang Beach is a very beautiful and unique beach. Padang Padang Beach is a small beach hidden behind a cliff in the Pecatu area, near Uluwatu. If yo want to go to Padang Padang Beach, you must pass a stairway that divides the cliff. Bedugul is a lake that located in a mountainous area with a beautiful natural atmosphere. The uniqueness of Lake Beratan Bedugul is the existence of a temple called Ulun Danu Temple. Ulun Danu Temple is located on the edge of Lake Beratan Bedugul and is one of the main attractions of Lake Beratan Bedugul. In addition, so that the holiday becomes more memorable, tourists can also enjoy water games and rent a boat at Lake Beratan Bedugul. Garuda Wisnu Kencana or commonly abbreviated as GWK is a cultural tourism park located in South Bali. Garuda Wisnu Kencana is a very large sculpture by I Nyoman Nuarta. 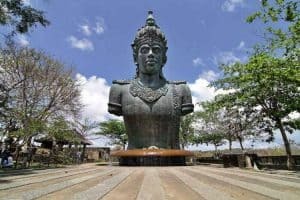 At present, the statue of Garuda Wisnu Kencana has not been fully made, only part of it has been completed, but even so you can still enjoy the splendor of Garuda Wisnu Kencana. In addition to the statue, you can also see the beauty of the limestone hill which is cut into large limestone beams. These limestone blocks will be filled with sculptures. In addition to the Garuda Wisnu Kencana area there is also an art theater, you can enjoy various types of Balinese dance and art in this theater every day. Lovina Beach may not be heard too often among local tourists. Lovina Beach is one of the most favored tourist attractions in Bali. At Lovina Beach we can see dolphins swimming and jumping in their natural habitat. Lovina Beach dolphins will usually play by the beach in the morning, therefore tourists will usually depart from the beach starting at 6 am. Besakih Temple is a temple located at the foot of Mount Agung and is the largest temple in Bali. 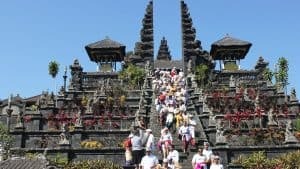 In Pura Besakih Hindu religious events are often held because Besakih Temple is believed to be a holy place and is the mother of all temples in Bali. Pura Besakih was built with the concept of the balance of God, human, and nature or often referred to as Tri Hita Karana. To be able to enter the Besakih Temple area, you must use a sarong that can be borrowed around the location of Besakih Temple. Uluwatu Temple is one of the tourist attractions in Bali which is above a cliff jutting into the sea. Uluwatu Temple not only offers a Balinese religious atmosphere, but also offers a beautiful panorama, especially the beauty of the famous sunset. At this tourist attraction in Bali, you will meet with a number of monkeys that are believed to function to maintain the sanctity of Uluwatu Temple. To enter the Uluwatu Temple area, you must use a sarong and a scarf which is a symbol of respect for the sanctity of Uluwatu Temple. Jimbaran Beach is one of the most famous tourist attractions in Bali. When you come to Jimbaran Beach, the first thing you will see is a row of dining tables and chairs on beautiful white sand. Yes, Jimbaran Beach is famous for its Balinese beachfront cuisine, especially its seafood. 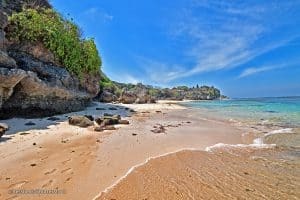 This tourist spot in Bali is perfect for those of you who want to travel to the beach while enjoying typical Balinese culinary tours. No need to worry about eating food at Jimbaran Beach because the waves at Jimbaran Beach are very calm, so it does not endanger you who are eating a variety of delicious Balinese culinary on the Jimbaran beach. Tanjung Benoa is directly adjacent to Nusa Dua, Bali. This place is the center of sports and water games in Bali. The characteristics of Tanjung Benoa Beach are very calm, so it is suitable for various types of exciting water games. There are snorkeling, sea walker, banana boat, parasailing, wakeboard, waterski, jetski, scuba diving, donut boat, flying fish, and others. In addition you can also go see giant turtles on the turtle island by riding a boat from Tanjung Benoa. Batur Kintamani Lake is one of the unique natural charms of Bali. Located on the 2nd highest mountain in Bali, Batur Kintamani Lake has a cool air and very charming scenery. 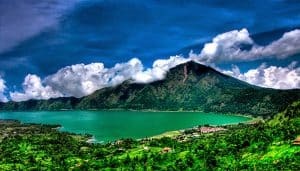 Batur Kintamani is the largest lake in Bali which is visited by many tourists because it offers unparalleled views in Bali. Ayung River Rafting has different characteristics. Ayung River Rafting offers beautiful mountain scenery. 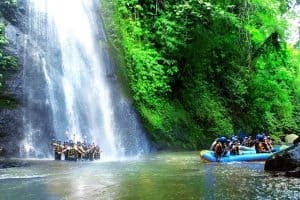 This is the one of the best place for rafting in Indonesia. The panorama along the Ayung River is very beautiful, coupled with sculptures on the riverbanks, and the green trees around the river complete the beauty of the Ayung River Rafting. Have you ever seen the spectacular bursts of sea water? Visit hidden coral cliffs in the Nusa Dua area to witness this natural wonder with your own eyes. Natural phenomena are formed from the high-speed Indian Ocean waves that hit the narrow gap between the coral cliffs, resulting in incredible water slides to burst high up.